I'm continuing to work on the wheelhouse interior. However, I had decided to try to get the wheelhouse outside finished and painted before the weather turns too cold to spray paint. Not sure whether that'll happen in time! So, I turned to the flybridge windscreen. 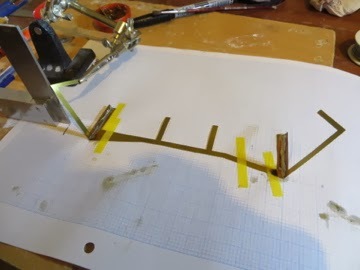 The three pieces were soldered together using my 'helping hands', square and graph paper to measure the correct angles. 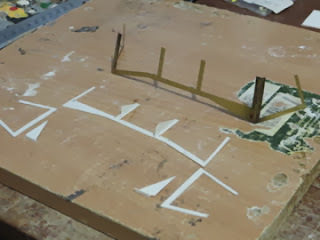 I then made the the inner frames from 0.5mm styrene. These will get bolt heads too but I'm holding off for the time being and will explain all next time. 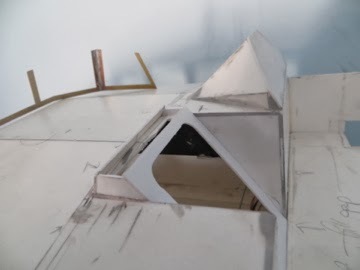 Building the windscreen has also highlighted a few issues with the top of the wheelhouse door. So I'm rebuilding that at the same time. Essentially. the build up on the cabin roof needs to be lowered, but here's the work in progress.